Two long-tail macaques by the Kinabatangan River. This entry was posted in Travel Photos and tagged 50 Year Project, Animals, Asia, Borneo, Humor, Kinabatangan River. Long-tailed Macaque, Life, Malaysia, Monkey, Nature, Photo, Photography, Sabah, South East Asia, Travel, Travel Blog, Travel Journal, Travel Photo, Wildlife. Bookmark the permalink. I do hope they forgive my crude humor. thanks for the laugh. love that shot. 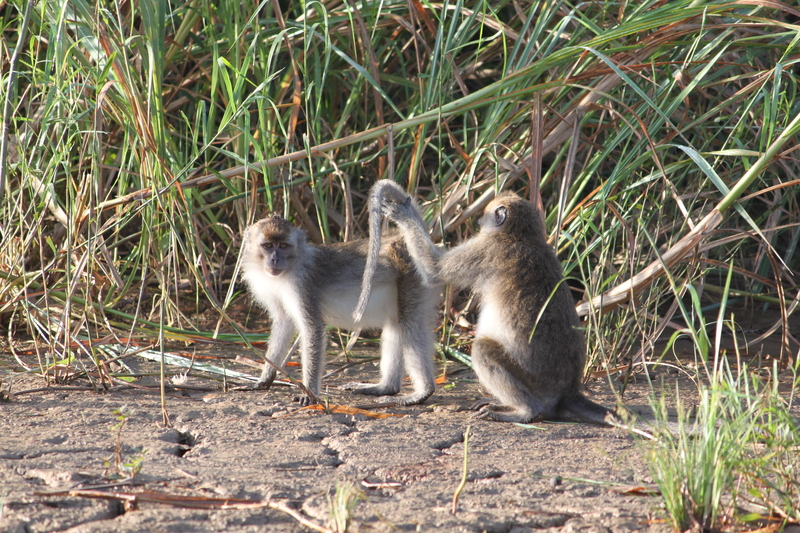 You have a monkey playing with another monkey’s tail, right? No respect for personal space. Sigh…. Some Preparation H will work wonders. Funny thing is I didn’t notice when i took the shot. Then I saw it on the computer and it made me laugh. I guessed you went there, great fun picture. Love the caption – just about spit out my cereal :). Oh I should put a warning so you don’t choke. LOL…HaHaHa…LOL!! Thanks for the laughs. I’m glad you enjoyed the photo even though you wanted more about the climb. These monkeys were characters and I enjoyed watching them. Hahaha, I love your caption.